This stunning halo ring features a 1/4ct of diamonds set in 9ct white gold. A truly elegant ring with diamonds cascading down the shoulders, this beautiful piece is the perfect token of love for your special someone. 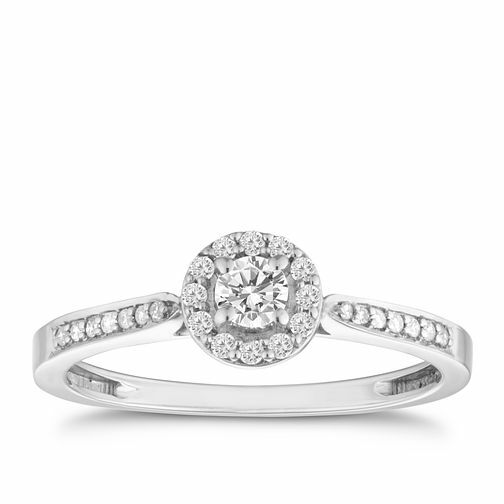 9ct white gold 1/4ct diamond halo ring is rated 5.0 out of 5 by 11. Rated 5 out of 5 by Anonymous from my girlfriend loved it! Had to approximate the ring size to start with when purchase made. Staff couldn't have been more helpful dealing with adjustment requests and returns. Thanks. Rated 5 out of 5 by Anonymous from Beautiful vintage style My fiancé bought me this in June 2013. We looked at rings together and I had originally wanted a completely different style. When I saw this in the window and tried it on it looked stunning. Not many people have an engagement ring like this so feels unique to you and I have had so many compliments about it. I still love my ring and can't imagine having anything else. And it is still in just as good condition over 1 year on so shows it is great quality.